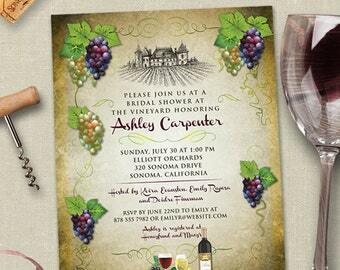 Please include all text with which you want the invitation customized. Use the sample as a guideline if needed. You will receive a digital proof via Etsy conversation to review and approve. This Mexican Serape Party invitation uses the pattern of a Mexican serape to make a unique background for a Mexican-themed celebration. An ancient Mexican sun ornament serves as the main focal point with custom party text underneath. 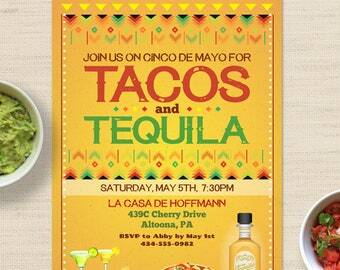 Use for a fiesta of any kind, whether it is a birthday party, margarita night or a Cinco de Mayo celebration. If you would like this invitation to suit a different event, we can accommodate any request. Customization of all wording is included. If you have design changes, contact seller for more info as it may incur extra fees. Please read this listing's description before completing your purchase. You will find details regarding our digital file formats as well as our printed paper descriptions that are required to complete your purchase. SPECIFICATIONS: 5" x 7" (vertical orientation), one-sided, 4-color. If you prefer an alternate size, please let us know. Our designs are flat textures and illustrations with NO embossed or glued embellishments. 1. 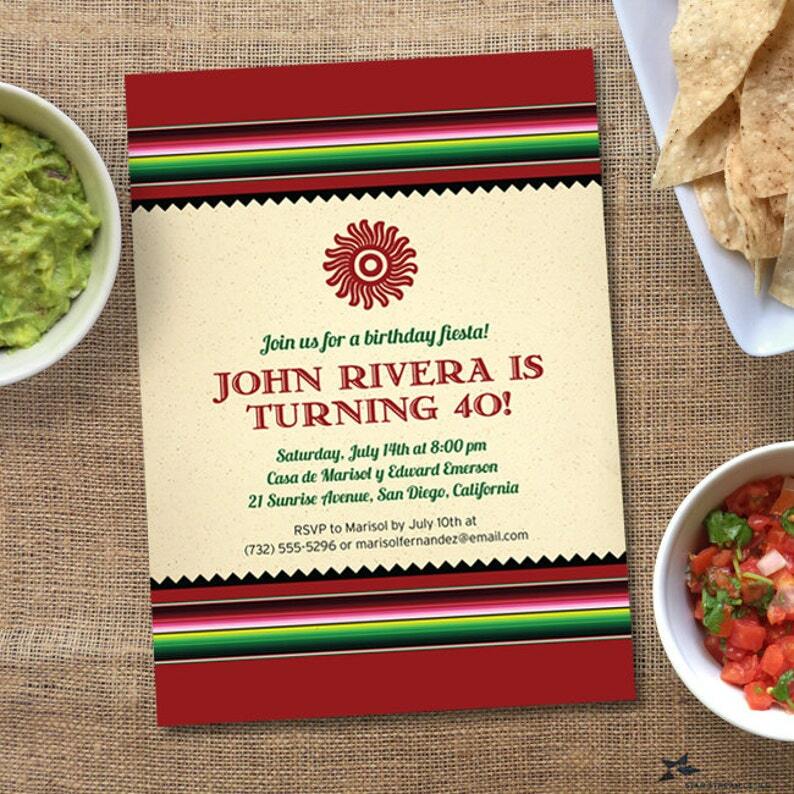 From the Printable or Printed menu, select if you want a digital file or printed invitations along with the quantity if we are doing the printing for you. From the File Format or Paper menu, select your digital file format or your choice for printed paper (see descriptions of digital options and paper below). Complete the purchase by adding it to your cart. 3. Proceed through the check out process. You will receive an email from Etsy confirming your order. 4. After we have received payment and your custom information, your order will be put into production. A low resolution, watermarked proof will be sent within 2 business days via Etsy conversation. This time frame may be subject to change. 5. Once are satisfied with your proof, we ask that you reply with your approval. Upon approval, we will email your print ready file if you purchased a digital order, or for printed orders your order will be sent to print. You must purchase the rush listing WITH this product listing. Please specify what format option you will need for your final printable file order. If you’re not sure which format you want, it is best to check with your printer or contact us for recommendations. OPTION A: Evite - Optimized for most standard smartphones, low resolution use in emails, send as text messages or share on social media. Great for last minute invitations. Select quantity of printed pieces and cover stock you want from both dropdown menu. 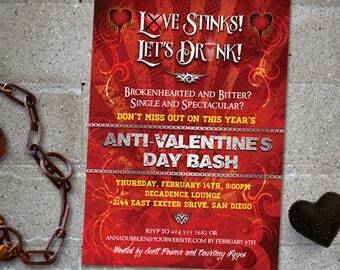 We suggest getting a few extra invitations if you are sending a large amount in case of problems. The suggested overage amount is 5%. 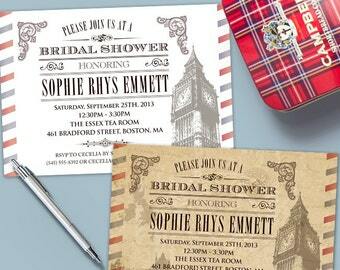 We only provide printed invitations for US addresses. • Uncoated White Smooth - A 110# bright white paper with a smooth surface. • Uncoated Cream Smooth - A 110# light cream paper with a smooth surface. • Semigloss White Cover - A 100# bright white paper with a coated, semi-reflective surface. • White Linen - A 100# pure white cover with a subtle embossed linen patterned surface. • Natural Linen - A 100# cream cover with a subtle embossed linen patterned surface. When you receive the proof, thoroughly review it. Verify that all information and spelling is correct. It is recommended that you double- or triple-check your proof. Star Stream Design is not responsible for errors not caught by the customer, regardless of fault. No refunds will be given in these cases. When everything is verified as correct, reply back to confirm which final file type you prefer for your customized digital printable (see PRINTABLE FILE FORMAT below). Once you have approved the final proof and indicated your preferred file type, we will send your finalized digital printable file(s) within two business days via the email associated with your Etsy account unless you indicate otherwise. This time frame is subject to change. Two rounds of revisions are included free of charge if needed. Additional rounds of revisions will incur a fee of $6 per round. Every monitor and printer is calibrated differently and may result in slight variations from what appears on the screen. Paper color and stock may also affect the final printed color. If something is not an exact color match due to these factors, returns will not be accepted. All purchased files and designs are available for personal (non-commercial) use only. You will not be able to edit any printable files. Selling, reproduction and/or redistributing designs by Star Stream Design is strictly prohibited. 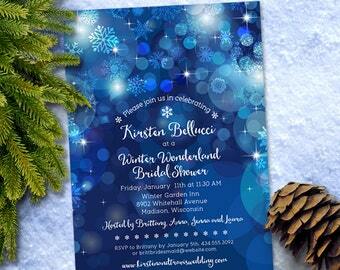 Printed invitations and cards delivered to you may not be reproduced and/or copied. Star Stream Design on Etsy accepts payments preferably through Paypal, but also by major credit cards and Etsy gift cards. Your order will be processed AFTER the payment has cleared, according to the number of days indicated by PayPal, or payment received via credit card. As soon as your payment has been cleared production of your customized order will begin. -Custom Orders will result in a design fee as well as original listing fee, payable via PayPal. -Original listings must be purchased and all designed approved by the customer before final files are sent in digital form OR custom print order is placed. -All printed orders will be approved by customer before going to print. Once digitally approved, there are no refunds unless your items have been damaged en route. Due to their customized nature, Star Stream Design's products can not be refunded or exchanged once production has begun on any project. If there is a mistake on our end, we will replace your order free of charge. Star Stream Design reserves the right to cancel orders at its discretion. Star Stream Design highly recommends carefully proofreading the text multiple times via the design proof we send you. Check your design carefully for spelling, punctuation or missing information. We cannot be responsible for any errors noticed after the final approval is given and there are no refunds on any design once approved by you. not offered. Cancellations will only be accepted if no work has begun yet on your order. You are paying not only for the product itself, when you purchase a listing, but also for the time it takes to work on your order. Please be certain of your purchase before you complete the transaction. Do not purchase if you know you might need to cancel, or if you have not allowed yourself adequate processing time to receive your order in time for your event. Refunds or complete refunds may not be available if work has begun on your order. Star Stream Design is not responsible for printing errors or color shifts that occur from your printing company of choice or your own home printer. Exact color matching is difficult to accomplish, and cannot be guaranteed via the print-at-home digital file delivery services provided by Star Stream Design. Please note that Star Stream Design will not be held responsible if you experience difficulty printing your digital files at home or at any printer because you did not provide specific instructions and requirements for a proper file set up prior to ordering your designs. If you ordered a wrong file format and request for an alternate file format AFTER your final file has been delivered, there will be a fee. Example : You received a PDF file format but it did not work for you and you want to receive a JPG format instead. Any request to update a final design or digital file will incur a fee. A fee waiver is possible, but entirely up to my own discretion (depending on the situation). If you decide to cancel your print order after receiving your first proof, I will refund your order minus a minimum $20 design and processing fee. If you decide to cancel your print order after multiple rounds of proofs, a minimum $50 design and processing fee will be charged. Once the final proof is approved, the printing process begins and there are no changes, cancellations or refunds. All printed sales are final due to their personalized nature. Since these items are instantly available, there are absolutely NO REFUNDS ON INSTANT DOWNLOADS. Please contact us with any questions before purchase. Star Stream Design reserves the right to refuse service, cancel orders, or cancel a business relationship or transaction at the Designer's discretion. Refunds for any services not rendered will be issued. Star Stream Design reserves the right to retain payment for services rendered up to that point. If you are unhappy with the quality of your product, please contact Star Stream Design before leaving feedback. We will be happy to work with you to reach a satisfactory resolution. SOCIAL MEDIA: In the event of a mishap or misunderstanding, neither party may defame the other on social media or other public venues. We commit to communicate and come to a resolution privately. Digital files are sent via e-mail in either jpg or pdf format, no physical items will be shipped. You will need Adobe Reader or Acrobat in order to open pdf files. When an instant digital download is purchased, you will be directed to a download screen after the purchase is made. Your customized digital files will be emailed to you with the following timeline once we receive notification of the wording changes you require. Star Stream Design is not responsible for print errors or color shifts that occur from your printing company of choice or your home printer. I reserve the right to cancel orders at my discretion. • Standard design turn around time is 2-4 business days. • Custom design turn around time is 5-7 business days. Custom designs require extra payment. • Customers need to expect between 24 and 48 hours for seller to review invoices and take necessary steps (i.e. email). Rush orders can be purchased for an additional cost in order to receive your file within 24 hours. We deliver quickly, but 24 hour turnaround can not be guaranteed unless the rush listing is also purchased. • Allow 48 hours per change up to 3 changes included. Additional changes are $5.00 each and will be billed via a custom listing. • Once the proof is finalized, the high resolution digital design will be emailed to you within 1 to 2 business days. Your e-mail provider may route the e-mail to your spam/junk mail folder, so please check those folders. If you do not receive your files within 48 hours of my e-mail notification that they have been sent, please send me a message, and it will be resent. NOTE: there will an extra fee incurred for invitations having to be resized to a non-standard size after production has already begun on your job. This includes online printers such as Vistaprint or FedEx/Kinko's as they have their own unique nonstandard size specifications. See https://www.etsy.com/listing/188698612/add-on-multipurpose-upcharges-design for more details. If you have not received your email link within 30 minutes of payment, please check your spam folder. If not, please contact me starstreamdesign [at] gmail [dot] com. Since these items are instantly available, there are no refunds on any instant downloads. Please contact us with any questions before purchase. Once you have approved the final proof, the print job will be submitted. Turnaround time can vary widely, but allow 7-10 business days from approval of final proof until you receive your printed order. • Changes to printed orders cannot be accepted after the proof has been approved as the printing process will be initiated. Please be sure you have all of your information correct by the time you approve the proof. • Printed invitations are not available for international orders outside the US unless shipping costs are agreed upon and paid in advance. • Business days refers to Monday-Friday 9:00am-6:00pm EST. Exclusions are standard USA holidays. All products sold are only for personal use, no commercial use is permitted. They cannot be manufactured, distributed, altered, edited, copied, sold, shared or used commercially in any way without my written permission. Selling of my files or the finished printed items for any purpose, in any way, through any other online or physical store is strictly prohibited. Digital files may ONLY be used for the exact purpose and event it was purchased for. For example, if it was originally purchased to be used as an invitation, it MUST NOT be altered, edit, changed, resized, cropped, cut out in whole or in parts and be reused again as an alternate piece (eg: menus, gift tags, place cards, etc.) EVEN IF it was for the same event. The file is strictly NON TRANSFERABLE in anyway and is protected by copyright. Only low resolution files at 72 dpi or below (less than 600 x 600 pixels in size) may be posted online (Website, blog, Facebook, etc.) or shared electronically as an e-card via email or such. The quality of the final product of designs personalized with your photo depends upon the quality of your photo submission. Please submit only high quality, clear photos with a resolution of at least 300 ppi at the final output size. I can not make a blurry, grainy or low-quality photo look better. Accepted file types include JPG, PNG & TIFF. Please be sure that you are the photographer or have full rights to and permission to use any photos you submit for use in our designs. Submit photos to starstreamdesign [at] gmail [dot] com. Thank you for your interest in our designs! Please feel free to convo me for any special requests. I'd be happy to help you! All invitations and items that are not instant downloads are meant to be customized. Please include all the text you want on your invite/card in the "Personalization" field on the listing's main page or the "Notes to Seller" section if/when you purchase. The cost for customizable products (not instant downloads) only include text changes. Color, font or design changes may incur additional fee(s). Can I see the design with my text before I purchase it? Please understand that it takes time to personalize or make changes to a design, therefore personalized samples or mock-ups are not provided prior to purchase. However, rest assured that up to two rounds of changes are included with your purchase and we will work to make your item just as you wish. 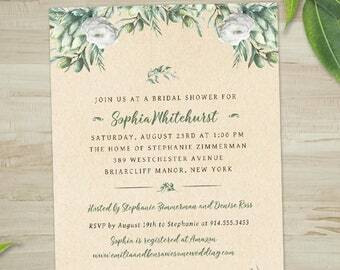 You do have the option of receiving a printed sample of any invitation. However they will not be personalized and there is a nominal cost for a sample. 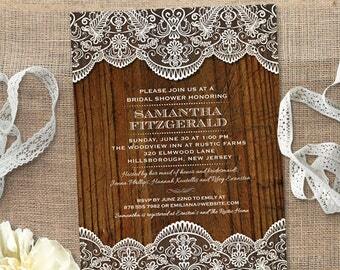 Can you change a wedding invitation into a non-wedding invitation? Our designs are meant to be customized just as you like so if you see a bridal shower or wedding invitation that is perfect for your event, we can change the text or even customize it further to fit your vision. When you place your order, simply send your exact wording for each card in the "Notes to Seller" section when you purchase your item. Your first proofs are sent via Etsy conversation within 24-28 hours. You then proofread carefully and let us know if you have changes. Once approved we'll send the final digital file or start printing for you. You can either print them yourself, take/send them to a local or online printer or we'll do the printing for you. Printing takes 2-3 business days until ready to ship. If you're unclear on the process, just ask and I will be glad to help. If you love your invites (and that is our goal), let us know and leave a review! What kind of file do I need if I order a printable digital file? If you are printing on your own, it's best to contact your printing partner to see what they prefer. For printing at home, it is easiest to use a single image jpg or pdf. If you use Staples or OfficeMax/Depot, we set up the file with multiple items on one page which saves on paper costs. If you're using a traditional printing company, they often want the file "press-ready" which means it has crop marks and 1/8" bleed. Vistaprint and FedEx/Kinkos has their own unique set-up so choose "Digital: Option F" if you're using them. There is a fee for size changing if we have to change the file AFTER we have sent you the first proof. These are only suggestions so PLEASE CHECK WITH YOUR PRINTING PARTNER BEFORE ORDERING. I ordered an editable instant download. Why doesn't it have the text I want in it? Instant downloads are ready to download immediately so we can not customize them for you. The cost is low because you do the personalization yourself. The text in the file is placeholder text so all you have to do is click on it and change it yourself using Adobe Reader or Acrobat. Editable instant downloads come with a set of instructions. This has links to any fonts used in the design, however most fonts are embedded. Many items have the option to change the font or style to any of any of your choosing, but doing this will change the look of the design and good results can not be guaranteed without using the original font. What kind of paper should I buy to print my printable? Ultimately, the paper is a personal preference. It is best to see and feel the paper if possible. If not, ask us and we can recommend some options. If you're purchasing printing through us, each listing has a description of the cardstocks available. We print on bright white or cream color stock so that the design is bright and clear. If you're unsure about what to choose, ask us and depending on the design, we can recommend what has work best in the past. Can you add a Hebrew name or other text to a Bar/Bat Mitzvah invitation? Absolutely! Just send us the Hebrew name or message as an image rather than text. English keyboards don't always read typed Hebrew lettering properly so with an image I can make sure to match the lettering exactly. I have a variety of Hebrew font styles so I can match the look of the other text as well. I can also work with text in any Roman alphabet language so if you want your invite in Spanish, French, German, etc., just make sure to include all your text written out with line breaks in the "Personalization" area or "Notes to Seller" section upon purchase. If you need text in a non-Roman alphabet other than Hebrew (eg: Arabic, Russian, Chinese, etc. ), there will be a slight fee required. Contact us ahead of time if you wish to do so. How long until I get my invitations/cards, etc. I work very quickly, so depending on my schedule you can receive your first proof within 24-48 business hours. 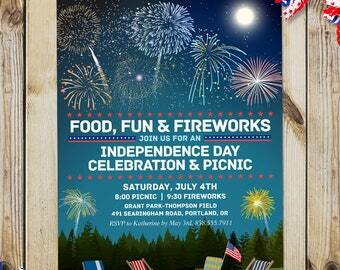 • Printed invitations and cards need 2-4 business days. (depending on quantity). Once shipped, delivery is 2-3 business days via USPS Priority Shipping (for most orders). For printed invitations or cards, please allow approximately 10 business days before you need your items in case of any possible unforeseen circumstances. Ultimately, the speed at which you receive your final printable or printed invitations relies on how quickly you can proofread and approve the proof(s). 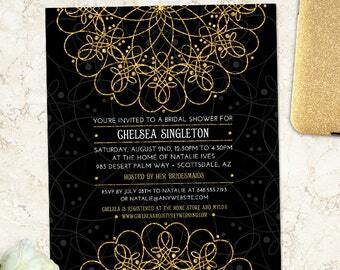 Can I get a blank invitation with just the artwork so I can make my own invitations? 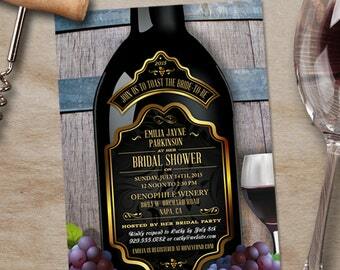 We do not provide invitations without text so that you have just the artwork. We have meticulously created the artwork and designed the text to fit and work within the design. The artwork is propreitary and I can not provide it as a "blank canvas" so that you can use it for your own invitation designs or other materials. In all cases, we are happy to customize any of our designs for you so please reach out if you have any questions.